There are a select few mountain bikers that live next to a trailhead. 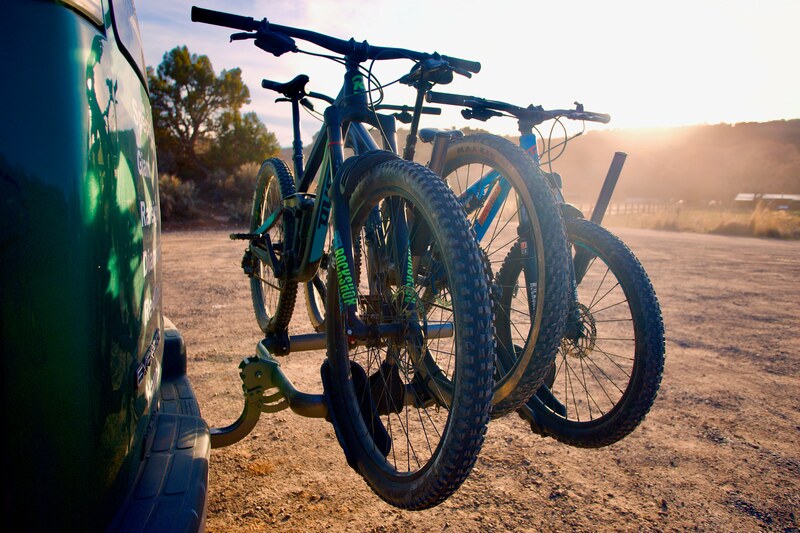 But for many of us mountain biking often involves hauling bikes on vehicles. There are a myriad of ways to accomplish this, but one of the most common and secure methods is hitch mount racks. 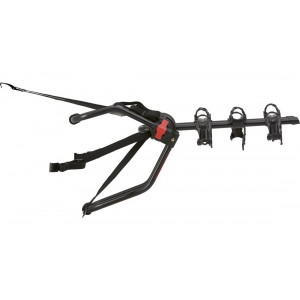 The Kuat Transfer 3 is a rack designed for hauling three bikes, without clamping to the frames all while remaining relatively affordable at $398. In this review we put the Kuat Transfer 3 through it’s paces over thousands of miles, through snow, over mountains carrying a wide variety of bikes. The Kuat Transfer comes in a big box, but it is not fully assembled. Unlike some similar racks the Kuat Transfer 3 will require some aligning of components and turning of bolts. None of it is rocket science, but expect to spend a little bit of time getting this put together. When installing on your vehicle the Kuat transfer comes with a sleeve to adapt it to 2″ hitch mounts or the sleeve can be removed to attach it to a 1.25”. It should be noted that 1.25” mount cannot be used on class 1 receivers. The rack, full assembled is by no means petite. Weighing in at 52lbs you may find that you want a friend to help you line it up and slide it into position. You will also want to keep this weight in mind when thinking about what vehicle you will be mounting this to. I’ll talk about this more in a bit. 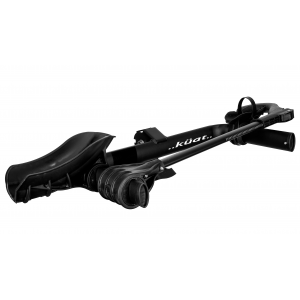 The Kuat Transfer is a “no frame contact” rack meaning that bikes attached to the rack are attached via their wheels alone. This has a number of advantages. First, the geometry and frame shape of your bike really don’t matter. Also, you frame isn’t going to get nicked up by frame clamps. In general I would say this type of rack is also easier to load and unload. There are a couple of disadvantages as well. Because bikes attach at the wheels, tire width and diameter is a limiting factor. Full fat bikes (4″ plus tires) will not fit without an adapter and 16″ bikes and smaller won’t fit. The front wheel is clamped with a ratcheting arm that swings into position and then ratchets down onto the tire. The clamping mechanism and tray is designed to accommodate a variety of wheel sizes and I was able to mount everything from a road bike tire to a 3″ plus tire without issues. The rear wheel sits in a swiveling tray that allows the Transfer to accommodate a variety of wheelbases. Unlike more expensive models the trays do not slide either laterally or horizontally but in practice I had no problem accommodating a variety of wheelbases and handlebar heights. Ratchet strap and swiveling tray. The Kuat Transfer features a 3 position fold away system. It is activated via a foot pedal and can be fully up and “stowed”, down in bike carrying mode and finally tilted down further to the ground to aid in rear hatch access. In practice, with bikes mounted, the rear gates on both the vehicles I tested this rack on were unable to clear the bikes. So, the final down position had limited use. Unfortunately the tilt with bikes on, did not clear the rear doors of either of our test vehicles. Your mileage may vary with this feature. As noted earlier this rack is heavy at 52lbs, once you add on three 30lbs bikes you are up to 142lbs hanging off the back of your hitch. For vehicles with more burly suspension and ground clearance this this shouldn’t be an issue. But when attached to a lighter vehicle you will definitely notice a difference in ride characteristics of your vehicle. That heavy weight though means that I had absolutely no mechanical issues with this rack in over a year of testing. Nothing broke. I might have tightened a bolt once or twice but that’s it. The tilt mechanism while not very refined feeling does not feel in the least bit flimsy. The plastic bits like ratchet straps and mounts are no worse for the wear. When driving with the rack loaded there is minimal motion of the bikes even on rough gravel roads. I had one incident where a bike was not secured sufficiently that I think is good to discuss. I had the perfect storm of a rough road and a high volume 2.8″ tire that began to leak while traveling. One of the limitations of any wheel mount rack like the Kuat Transfer 3 is if your tire goes flat the wheel can become loose in it’s mount. This happened to me and before I was able to notice it, I hit some sizable bumps that dislodged the bike from it’s front tire mount. Thankfully this resulted in minimal damage with the only casualty being the tire. As noted though this is a weakness of any wheel clamping style rack and is not a specific issue with the Transfer 3. I’ve been very happy with the Kuat Transfer 3. If you have a vehicle with some load capacity and don’t mind needing to potentially take your bikes off to access your trunk it may be a good fit for you too. When it comes to hauling three bikes without touching the frames this is one of the best bang for you buck buys on the market. 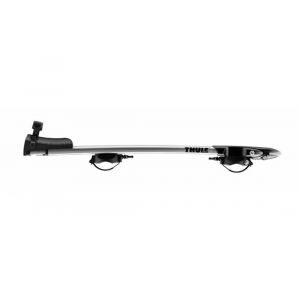 Kuat Racks Pivot Swing Away Extension 2"